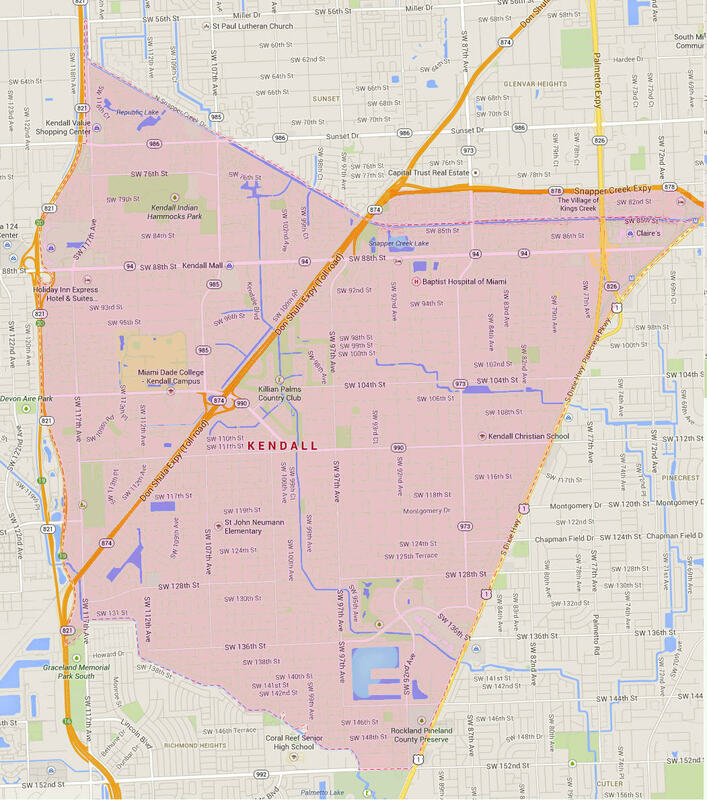 Kendall is an unincorporated community and census-designated place in suburban Miami-Dade County with over 29,000 residents, located between South Dixie Highway west to Florida’s Turnpike, and from 878 south to points north of SW 152 Street. The history of the Kendall/Falls area begins in 1883, when much of the land was purchased from the State of Florida by the Florida Land and Mortgage Company. The community was first known as Rockdale and later named after Henry John Broughton Kendall, a director of the Florida Land and Mortgage Company. He moved to the area in the 1900s to manage the company’s land. The first post office did not open until 1914 and the first school opened in 1929. The development of the land was slow until the 1926 land boom. There were also Seminoles that continued to live on the land into the 1940s. Like most of the communities in South Florida, many homes were destroyed during Hurricane Andrew in 1992. The community had to slowly rebuilt homes and businesses. Kendall School was the first public school of the community and is known today as Kenwood K-8 Center. Other public schools in the area are Sunset Park Elementary, William Lehman Elementary, Vineland K-8 Center, Gloria Floyd Elementary, Leewood K-8 Center, and Killian Senior High School. The private schools designated for Kendall include Riviera Preparatory School, St. John Neumann Catholic School, and St. Catherine of Siena Catholic School. Miami Dade College Kendall campus, also known as MDC, is located on Killian Drive, between SW 117th Avenue and SW 107th Avenue. Miami Dade College operates seven campuses located throughout Miami-Dade County. The Kendall Campus is the enrollment and disbursing office. Also, it is where the office of the college’s president is located, as well as The Honors College. The Kendall/ Falls area offers restaurants and shops including Dadeland Mall, Town and Country Mall, The Falls shopping mall and much more. Dadeland Mall is a large enclosed shopping mall located in the Dadeland district, with access to the Dadeland Metrorail Station. The mall is always expanding and adding shops and dining to appeal to all visitors. Some of the high retailers in Dadeland include Nordstrom, Saks Fifth Avenue and the Apple Store. One of the mall’s largest restaurants is The Cheesecake Factory. Town and Country Mall is an open air mall filled with shops and dining. The Falls is another open air shopping center with a cinema and surrounded by various restaurants. This mall has over 100 upscale stores including Macy’s and Bloomingdale’s. The Falls has been operating since 1980 and as the name suggests, it contains several bridges, waterfalls and pools. Some of the parks located in the Kendall area include Rock Ridge Park, Ron Ehman Park, Kendall Indian Hammocks Park, Briar Bay Park, and Briar Bay Linear Park. Also located near the center of Kendall is the Killian Palms Country Club. The club hosts events such as weddings and tournaments. Rock Ridge Park includes green space, a children’s play area, a roofed area for parties, and a walking path. Kendall Indian Hammocks Park is perfect for the skateboarder, with concrete paths and ramps, as well as a full service skate shop called Sugars Drop Shop. Skateboards, inline skates, scooters, and bikes are permitted with mandatory helmet use for anyone under the age of 18. The park offers camps, lessons and birthday party options. Kendall’s large and diverse community has something for everyone. The Kendall/Falls area is filled with restaurants of all types of cuisine, shops, different businesses, parks, and local events. As a desirable place to live, work and play, Kendall/Falls is central to all of what South Florida has to offer. If you have any interest living in the Kendall/Falls area, contact us and we will assist you with your real estate needs.